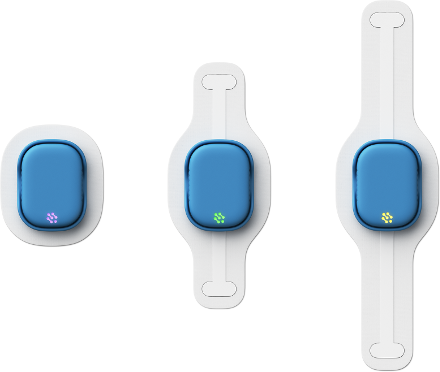 The Soterix Medical HealthDot solution integrates the Byteflies Sensor Dot device with ElectraRx- the unique Soterix Medical portal that connects stimulation administrators/ clinicians to the individual’s data. The Sensor Dot at a size of a quarter is the smallest device that can acquire as many as 6 high quality synchronized physiological signals. It can measure Electrocardiogram (ECG), Photoplethysmogram (PPG), Respiration, Motion (IMU) around the clock for 24/7 monitoring. In addition, the Sensor Dot allows full access to raw data while providing unmatched comfort with multiple patch options. 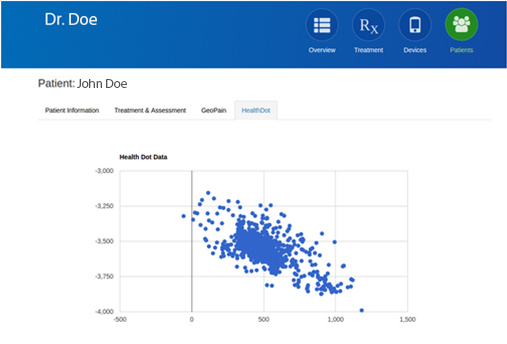 The ability to track an individual’s vital signs through the ElectraRx platform now opens up several possibilities- from correlating stimulation outcome to physiological well-being, aggregating vital sign data to detect anomalies/ trends, to adjusting stimulation strategy if needed. ECG signals provide information on the cardiac electrical cycle. The waveform is characterized by five peaks and valleys (P,Q,R,S,T)where each one represents a change in the electrical potential of the heart resulting in a muscle activity . The most differentiated peak is the R-peak that represents ventricular depolarization. The consequent R-R peaks are used to measure the heart cycles, and subsequently heart rate (HR). The ECG wave is used to analyze cardiac rhythm, ischemic changes and to predict and treat acute myocardial infarctions and coronary events. Acquisition: One end of the patch is positioned on the sternum, the other angled towards the heart. Best signal amplitude is obtained by mimicking a lead II in a standard 6-lead ECG which reflects an angle of 60 degrees relative to the shoulders. A photoplethysmogram is an optically obtained plethysmogram. By illuminating the skin and measuring changes in the ensuing light absorption, a PPG waveform indicates variation in blood vessel perfusion. The PPG wave comprises a pulsatile AC wave (attributed to cardiac synchronous changes in the blood volume with each heart beat) superimposed on a slowly varying DC with various lower frequency components (attributed to respiration, sympathetic nervous system activity and thermoregulation). PPG waves are used to measure heart rate, oxygen saturation, blood pressure and cardiac output assessing autonomic function and also detecting peripheral vascular disease. Acquisition: Recommended patch locations include the wrist, forehead, behind the ear, upper arm, and high on the chest. Both skin tone and body type (e.g. subcutaneous fat) may influence signal quality. The respiration signal, measured via bioimpedance on the chest, quantifies breathing rate and the relative depth of abdominal or thoracic breathing. In addition, more detailed analysis of breathing dynamics can be performed such as labored breathing, tachypnea, coughing etc. Acquisition: Same acquisition as ECG. The same patch can be used to record both ECG and respiration and also simultaneously if desired. One end of the patch is positioned on the sternum, the other angled towards the heart. Best signal amplitude is obtained by mimicking a lead II in a standard 6-lead ECG which reflects an angle of 60 degrees relative to the shoulders. An Inertial Measurement Unit (IMU) comprises of 3 separate sensors: 1) an accelerometer that records acceleration in 3 dimensions; 2) a gyroscope that records rotation around 3 axes; and 3) a magnetometer that records the strength and direction of the earth’s magnetic field. The signals from the sensors quantify movement, type of activity and relative position and have applications in medical rehabilitation, posture evaluation and sports performance. Acquisition: The patch can be placed on any limb and on chest, abdomen,etc. depending on the application. Areas of high impact (e.g. ankle during running) may show increased signal saturation.